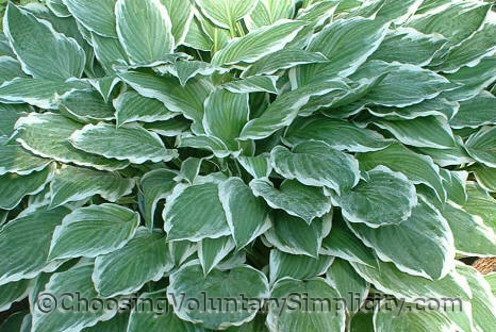 Hosta ‘Undulata Albomarginata’ has been the most commonly planted hosta for the last hundred years. Unfortunately slugs love it too, and without slug protection it can look pretty awful in just a few weeks. The dark green leaves of a young Undulata Albomarginata are thin and smooth, but it develops a slight corrugation as it matures and the white margins seem to blend into the green, creating a very pretty effect. This hosta produces a lot of flower scapes but supposedly does not form seed pods… although last year two of my Undulata Albomarginatas did form seed pods. I tried planting a few of the seeds but none of them germinated. Thank you– this just confirmed the identity of an old hosta, on of two that were given to me when I moved into my old house five years ago. 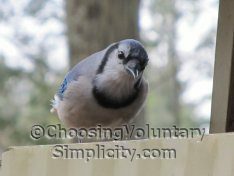 It is a Vermont standard, but nobody knew the name of it! 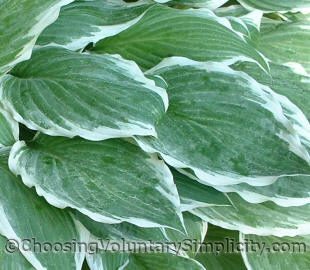 I got interested because I love hostas and have begun collecting them. It seemed a shame that my first ones were still nameless, especially this beauty. I’m glad my search brought me to your site. I’ve now bookmarked it and will be returning often… to read new posts and catch up on old. So many of the things you write about parallel my own life! Thanks for helping me identify my hostas. We just moved to an old house and there are 5 of these growing in front of the back veranda. They are very large and are beautiful but I had no idea what they were. Great pictures. Thanks. This is *IS* a slug magnet. Mine always were full of holes until I realized those holes were slug damage. I have found that the beer, copper strips, eggshells and all the other remedies don’t work that well but I finally have slugs under control.